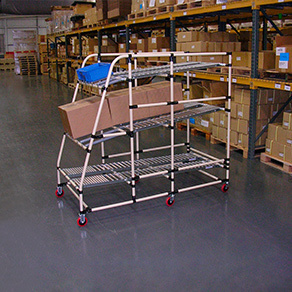 Angled Conveyor slopes to allow containers to flow from load end to picking end positioning components close to workers helping reduce repetitive motion injuries. 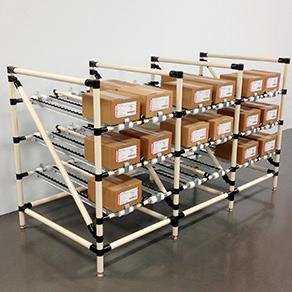 Five Level Flow Rack with adjusted levels accommodate diverse weights, size and number of items assuring proper downward travel to the front or off-load point. 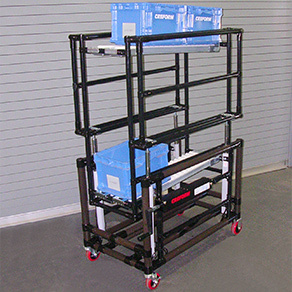 Unique Flow Rack securely holds unpackaged parts and components on angled skatewheel rollers and open center passage allows products to extend unimpeded below the rails. 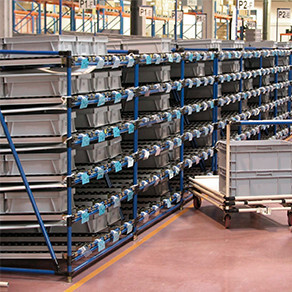 Heavy-Duty Flow Rack holds extensive supply of containers for feeding production area with ample return lanes for holding emptied containers. 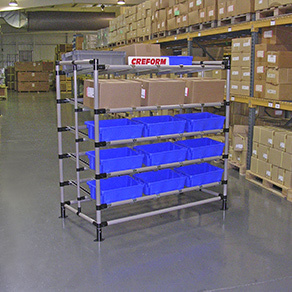 Flow Rack built with Creform 42mm pipe and components combines heavy duty handling and storage capacity with simplistic gravity-fed point-of-use part/container conveyance. 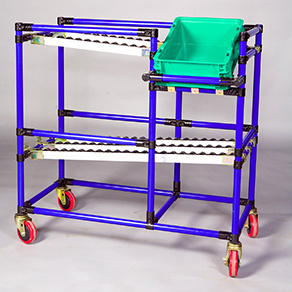 Angled Flow Rack lanes slope lengthwise allowing containers to flow from load to picking end while second lane tilts containers for easy picking and viewing contents. 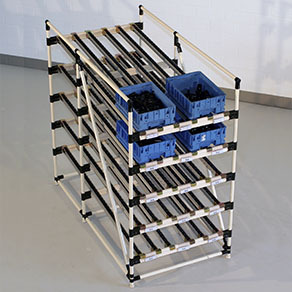 Supermarket Flow Racks with six levels are connected with brackets to maintain spacing and alignment while high-level density provides efficient order picking. 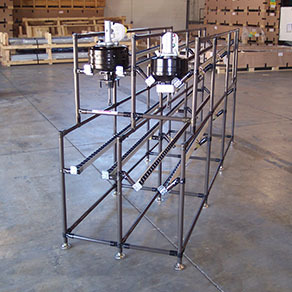 Bent Pipe Flow Rack guarantees FIFO ergonomic “strike zone” and bent pipe frame offers pleasing aesthetics while reducing the required number of metal joints to assemble. 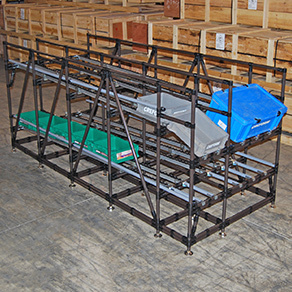 Flow Rack with hydraulic height adjustable function raises and lowers the upper flow lane to match height of feeding conveyor at the receiving point where totes are easily rolled off. 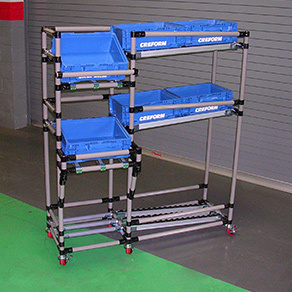 1800 lb Capacity Flow Rack built with 42mm pipe and four vertical frames use single angle braces for stability using 28mm pipe and 42mm/28mm transition joints. 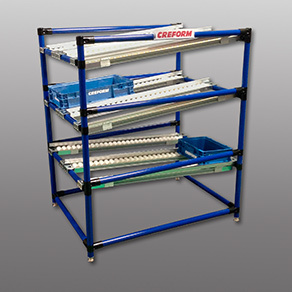 Heavy-Duty Flow Rack built using 42mm pipe & joints has 1500 lb capacity and Placon wide roller conveyors handle both plastic totes, corrugated boxes and unpackaged parts. 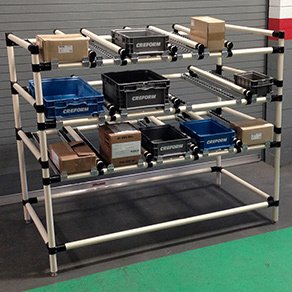 42mm Pipe & Joint System provides rigidity and strength for industrial applications without the need for cross bracing while conveying either boxes or plastic totes.